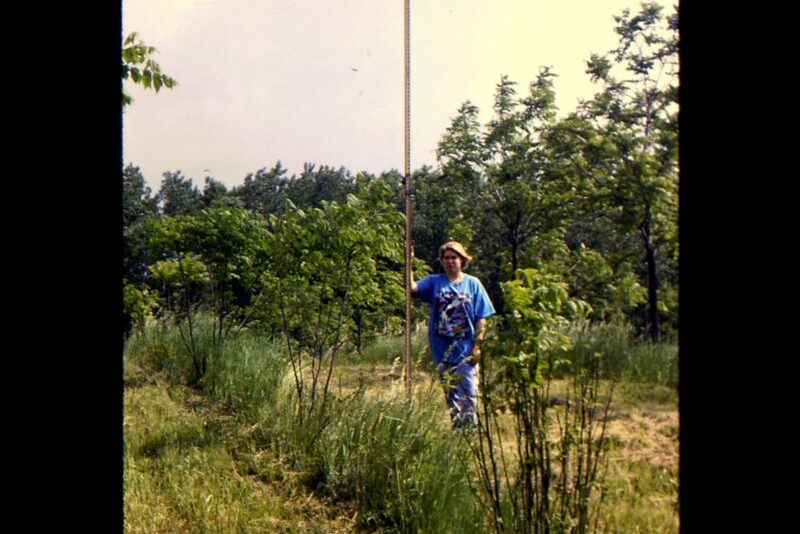 Can coppicing protect black walnut trees from deer? The 4.3-acre Goodrich black walnut plantation was established in 1983/1984 for the purposes of managing for long-term nut & high-quality wood product production. 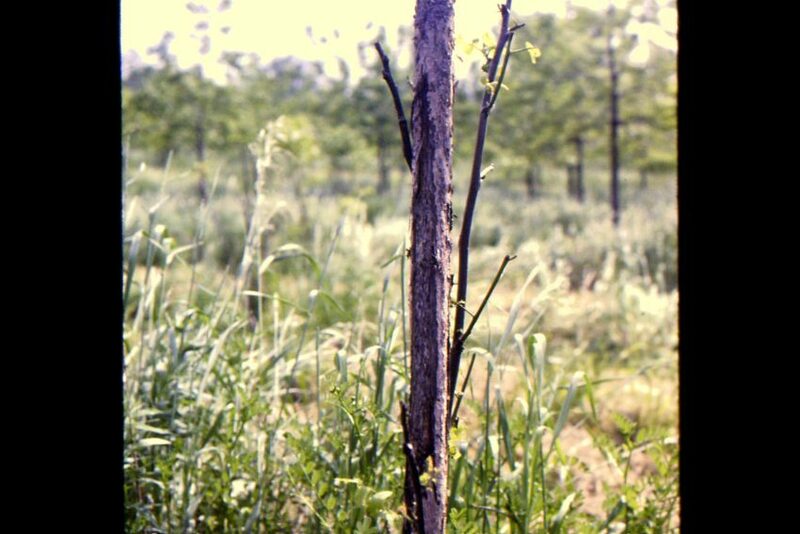 Deer damage (browsing and antler rubbing) was prevalent on many trees during the first 10 years of growth. 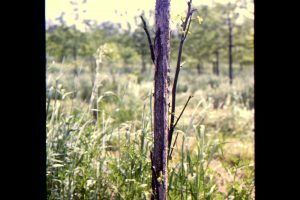 Bill Minter, Director of Land Management, initiated a study on “coppicing” in 1995 to determine if tree form and growth could be improved in the midst of heavy deer pressure. physical damage that results in undesirable stem form. Due to its well-established root system and the ability of a young tree to re-sprout from its cut stump, it can regenerate quickly with multiple stems. After several years of growth, the most vigorous and well-formed stem is maintained and the remaining sprouts are removed. Vigorous, well-formed stem with dead, remnant auxiliary sprout 20 years after coppicing (2015). 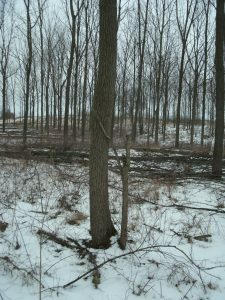 was coppiced and the most vigorous and well-formed stem was selected after the sprouts were at least head-high in height. But the remaining stump sprouts were only partially cut back to chest-height. This reduced the light competition on the maintained sprout, but provided a physical impediment for deer to access and damage it with their antlers. Over the ensuing years of growth, these auxiliary coppice sprouts eventually died from the over-story shade. 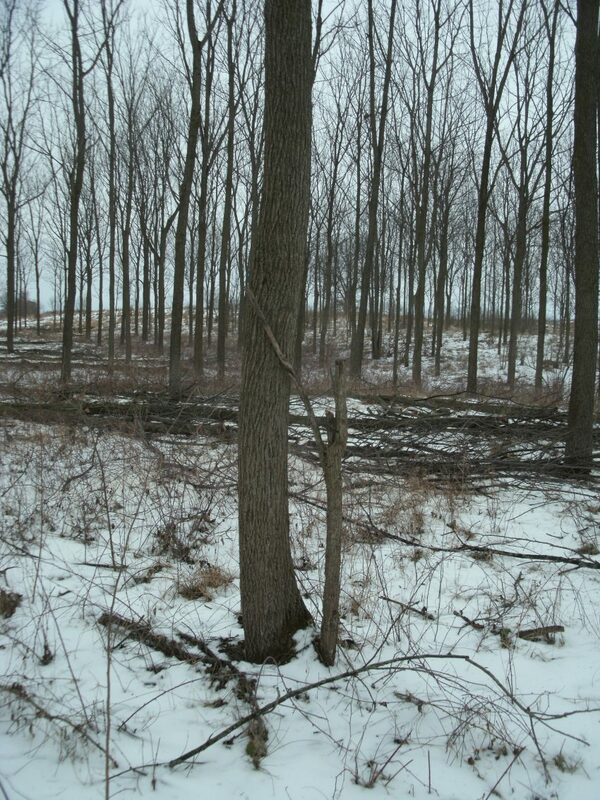 What remained was a larger, well-formed stem that was of a diameter that was no longer susceptible to deer damage. Are salamander populations declining at Merry Lea? Merry Lea has also been a location for studying the spotted salamander. This work took place in the 1990s while Dr. Mary Linton was Lindsey Fellow. Populations of amphibians have been declining in many habitats, and Linton and her students gathered substantial information about the situation at Merry Lea. Weather conditions such as droughts or prolonged winters place considerable stress on these creatures that depend on shallow water for breeding and protective cover for winter hibernation. How and why are spaghnum bogs at Merry Lea changing? Dr. Anthony Swinehart, now at Hillsdale College, Hillsdale, MI, studied the bogs of Merry Lea as part of his graduate work at Central Michigan University and Purdue University.